The banking and finance system must serve the interests of the people and the country. Currently this is not the case in Australia .... and much of the world. BRN was set up to help educate people regarding the way powerful interests have hijacked the banking industry to enable the systematic looting of the people and the country. Insurance scams, financial planner scandals, mortgage fraud, credit card rip offs, abuses of farmers & small businesses, excessive fees and penalties are just the tip of the iceberg. Banks have been fined billions of dollars in the USA and Europe but the bankers are not jailed and the victims are not properly compensated. Abuses persist because the proceeds of crime exceed the penalties. That equation must be changed. Once people really understand how a corrupted political system interacts with crooks masquerading as businessmen we predict that you will be motivated to demand change. When enough of us are at that stage we will be ready to take action. Keep your eye on the Big Bank BANG Countdown. 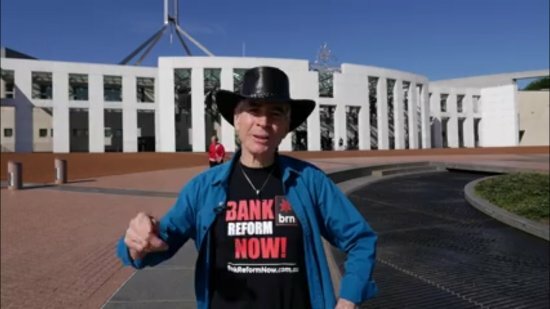 In Australia we will lobby politicians and target banks one at a time. Don't worry all bankers will eventually feel your anger. Join in and help reform the banks ... and maybe even our politics. We have all the power. The bankers and politicians know it and are scared of it. We will win pretty soon after more of you know it too. Every single one of us is damaged by corrupt banking practices - regardless of whether we have a bank loan or not. Follow the links below to find out more and join us in taking action. Reform must come very soon to Australia if we want to avoid potentially devastating affects on individuals, families and businesses.